For some people taking time to just wallow and stew in their sadness, is actually helpful for their healing process. For some it seems self-indulgent and like a waste of time, so they often push their feelings aside and do not take this time to really wallow. 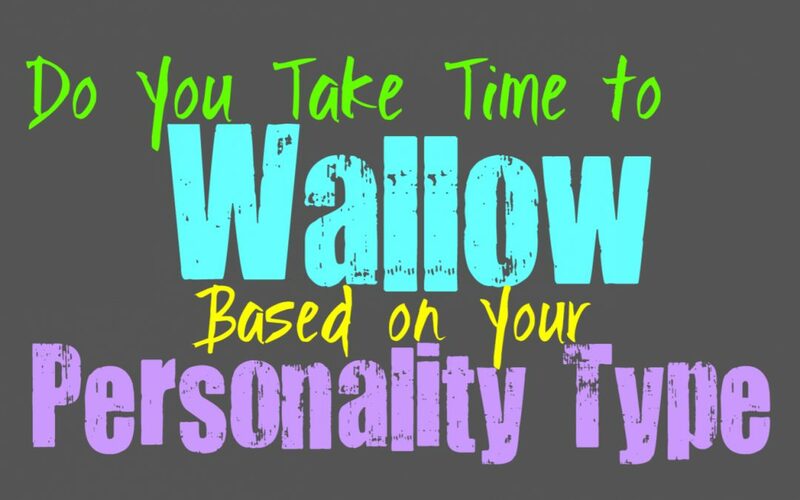 Here is how likely you are to wallow, based on your personality type. INFJs definitely need time to wallow, but they often want to take this time by themselves. They need to process their emotions and figure out what is making them feel so down. If there is something truly bothering the INFJ they need to retreat inward, and sometimes this does mean wallow or even feeling a bit sorry for themselves. Without this time to process everything and dive into their own inner minds, the INFJ becomes drained and even a bit short-tempered. They might feel guilty for wallowing or pitying themselves a bit, but in truth they need this time. ENFJs rarely have time to really wallow, and sometimes this idea can feel truly selfish. They often focus so much on caring for others and so doing anything that focuses on themselves will give them guilt pangs. While ENFJs don’t often feel like they can take time to wallow, this is often something they need and deserve. They usually try to find ways to distract themselves and keep moving forward when there is something bothering them. ENFJs often feel like stepping back and allowing themselves to sit in their own sadness, means they are failing themselves and others. INFPs are definitely likely to wallow, but this is simply because they believe in understanding and experiencing their emotions. They can’t just push their feelings aside and ignore them like some people. For the INFP it is healthiest when they do take the time to wallow and experience their sadness. The important thing is for them to find the balance between wallowing, and letting go of this pain. INFPs do want to experience their feelings instead of brushing them off, since this is what helps them to understand themselves and really reflect. While wallowing is often important for ENFPs, they sometimes forget to really take the time to do this. Many ENFPs find themselves wanting to push through their pain in search for more pleasant emotions. They can become upset with too much negativity and want to seek out things which will bring them comfort. For the ENFP it is truly important that they take time to wallow and process their emotions, but they often put it off for a while before realizing they have no choice but to cope. INTJs aren’t likely to wallow, since this feels self-indulgent and wasteful. INTJs often do the opposite of wallow and instead try to find ways to distract themselves from whatever might be bothering them. For the INTJ spending too much time diving into their own inner emotions, is both draining and unsettling. They are more drawn to facts and things they can logically understand and prove in a tangible manner. INTJs often try to analyze their emotions in a more logical manner, and will likely move on from them as quickly as possible. ENTJs are very logical people who prefer to focus on being as efficient as possible in their lives. They don’t like doing anything that might prevent them from moving forward and working towards their future. For ENTJs wallowing often seems pointless and even a bit weak. They can be rather hard on themselves and they don’t like showing any signs of weakness, especially around others. For the ENTJ wallowing definitely feels like they are failing in some way, since they aren’t strong enough to push through. While INTPs can be focused on logic and analysis, that doesn’t mean they don’t feel things very deeply. INTPs will often try to find ways to understand their feelings in a more practical manner, but at the same time they often struggle to do this. INTPs do sometimes wallow in their own thoughts and even negative emotions that might be overwhelming them. Sometimes this time to wallow can be good for the INTP, but they often feel guilty which makes it hard for them to really heal and let go the right way. ENTPs really don’t like wallowing for too long, especially since this can drag them down too much. ENTPs often need to distract themselves and connect with others in order to stay in a positive mindset. For the ENTP wallowing can actually pull them down and lead them to overthinking about things they shouldn’t. They do want to process their feelings and don’t like being forced to behave a certain way. When the ENTP wants to wallow they will certainly do this, but they don’t like letting it go on for too long. ISTJs don’t like wallowing, since this often feels a bit selfish and even a bit wasteful. They prefer to focus on getting things done and want to live up to their responsibilities. For the ISTJ it can feel like a failure if they spend too much of their time wallowing in their sadness or emotions. They often prefer to focused on their priorities and being able to overcome the struggles in their path. In most instances the ISTJ just prefers to avoid negative feelings, and work hard to live up to their own expectations. ESTJs aren’t wallowing people, since they often feel like this is a weakness in some ways. They don’t like feeling like they have failed themselves or others, and would rather push through anything that is bothering them. When the ESTJ is overwhelming with emotions and finds themselves wallowing, they are likely to feel immensely guilty about this. They much prefer to push through any negative situations or emotions and keep themselves focused on the road ahead. ISFJs aren’t naturally the type of people who will wallow since they much prefer to focus on being practical. They want to care for their loved ones and focus on their tasks and responsibilities. ISFJs don’t like feeling as if they have failed someone they love and wallowing can sometimes feel this way. They often push through the things that are bothering them and strive to hold themselves together even during times of trials. ESFJs don’t like to wallow, especially not when they are around their loved ones. They prefer to remain as strong as they can, and focus on taking care of their responsibilities. For the ESFJ wallowing can truly feel like a weakness, and makes them feel like they are failing those around them. Sometimes ESFJs can push themselves a bit too hard and don’t take the time and space to wallow, which they certainly need in order to process certain emotions. ISTPs aren’t usually fans of wallowing, since it feels like a waste of their time and energy. They are often rational people who prefer to focus on living in the present. ISTPs don’t like obsessing over things from the past and so sometimes they can push aside emotions which they should be processing. Instead of wallowing ISTPs often seek to take action, and even go out and find something new to distract and excite them. ESTPs sometimes avoid wallowing when they feel overwhelmed, and instead seek out excitement. They can become a bit reckless when they are experiencing something upsetting. When the ESTP is pain they often want to avoid feeling it directly, and so they try to distract themselves and find things which will keep them entertained. They often need to come down from this and eventually will have to wallow, but they often want someone by their side when they are feeling this way. ISFPs do sometimes need to wallow, especially when they are experiencing something upsetting or painful. They sometimes just need time to themselves to feel their emotions and get caught up in their own thoughts. ISFPs do enjoy having loved ones who are there for them during this time though, someone special who they trust to just let them feel their own emotions without judgement. ESFPs aren’t usually wallowing people, simply because they try to focus on positivity. If something is bothering them they only wallow for a short time before they seek out something to distract them. ESFPs are happiest when they are find something which sparks their passions and brings them into the present moment. ESFPs aren’t fans of dwelling on the past, and would much rather enjoy their lives in the present.